Despite not attending this year, I felt far more involved in Austin City Limits (ACL) than I ever did attending. 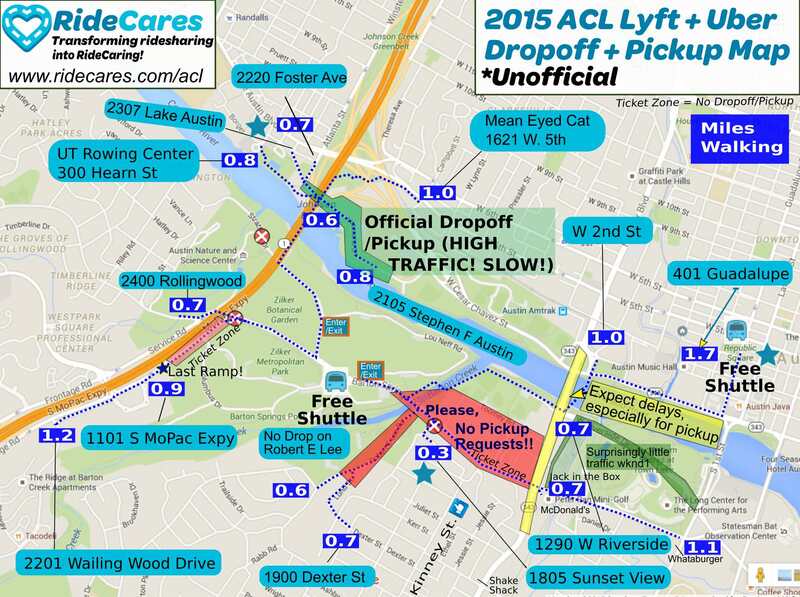 After seeing how many drivers were attending our Lyft Austin Weird meetups in anticipation of ACL to discuss tips as well as drop-off/pickup locations, I decided to make a map to help drivers and passengers decide on the best dropoffs. The map was an evolving collection of advice and experiences from many drivers in the 1,000+ Lyft Austin Weird Facebook group. (Thanks for all the help guys!) Despite the stressful feeling of playing "air traffic controller" for a day or two, I'm glad many drivers and passengers benefited from knowing drop-offs without heavy traffic and where they weren't allowed to drop-off. Lesson learned: Passengers appreciate a driver with a printed map! Lesson learned: Community collaboration rocks! Check out my fire Mix-Tape! 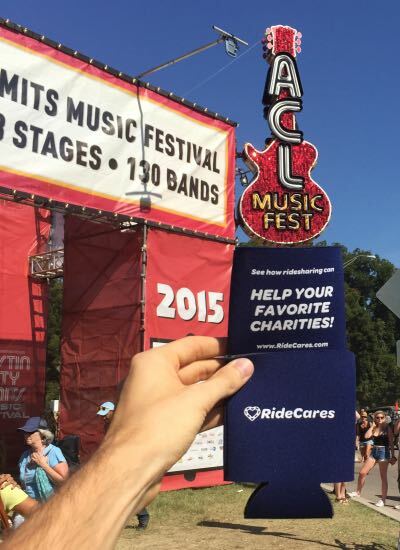 When I wasn't busy playing part-time cartographer, I joined the scalpers and folks passing out mixtapes to distribute hundreds of RideCares koozies. 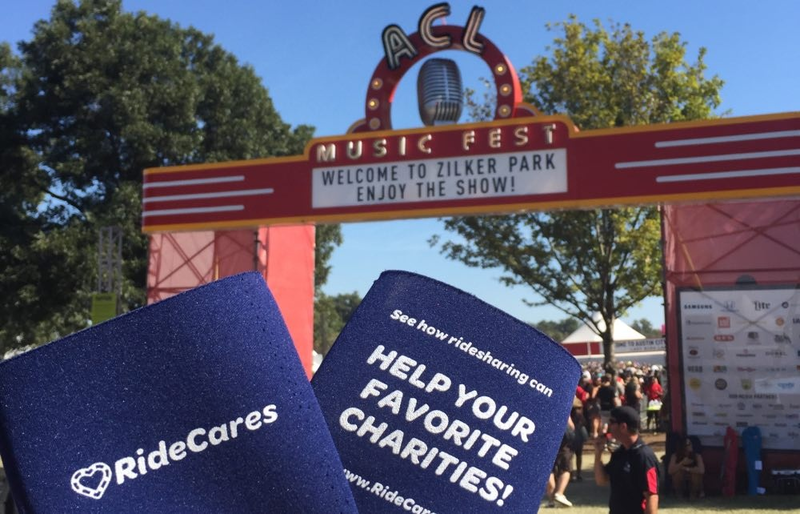 The "Official TNC (Transportation Network Company) Dropoff" was the perfect target audience to raise awareness for RideCares with free koozies containing RideCares promo cards. I did enforce some restrictions on who could receive a free koozie: 1) No koozies for Lebron James fans, and 2) I went out of my way to track down bros in Michael Jordan jerseys. Lesson Learned: Scalping ain't easy. After an hour, the lone scalper had only made one deal and was rejected thousands of times. I offered him a few of my remaining koozies to pass out for the opportunity to know something other than rejection. Afterward, I took a few koozies over to the main entrance. Cell phone reception. Cancellations and difficult pickup communications are soooo 2015. If networks can properly boost their availability for festivals or WiFi is provided (where you at Google?!) everyone will have a much safer experience. Ridesharing apps disallowing requests in zones where people cannot be picked up for special events. More intelligent location based dispatch zones for special events. The "closest" Lyft or Uber to a passenger distance wise may be on the other side of the festival and have to spend 25 minutes getting to a passenger due to road closures and traffic. Reworked Lyft Line and Uber Pool carpooling algorithms for specific events for optimal efficiency.